Project obstacles and solutions: Martinrea International was expanding their metal stamping and welded-assembly plant in Hopkinsville, Kentucky. 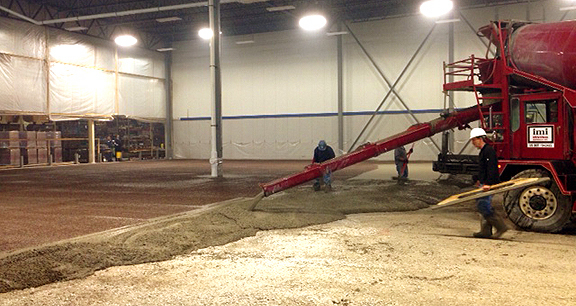 The concrete floor was specified to be 4,000 psi concrete and was to be finished with a shake on hardener. Two issues needed to be addressed on this job. First, the design specifications called for a maximum amount of bleed-water from the concrete to help bond the hardener to the concrete. This is an older method of applying hardeners. Typically hardener is applied to concrete that has been batched with a minimal amount of bleed-water to prevent dry shrinkage cracks and curls. In this case, IMI QC/QA went back to the drawing board and produced a mix design that used no water reducer to meet this requirement. Taking out the water reducer limited some of the controls, particularly as it pertains to the amount of time concrete can stay on the truck before it begins to set up. Many finishers would add water to the mix on the site to compensate for this, but this impacts the slump and strength of the concrete. It also can contribute to dry shrinkage cracks and curling slabs. Too much water in the mix will cause the slab to shrink like a sponge as the water evaporates out of the mix. The IMI team at the Hopkinsville concrete plant worked in tandem to make sure that trucks were loaded and spaced to keep concrete flowing without a time lapse, but also were not required to be re-tempered with additional water when they arrived. This kept the slump and strength in precise controls. It also prevented any shrinkage problems with the finished slabs. The second issue was space restrictions and atmospheric conditions on the job site. The new annexed construction site was open to the factory area of the facility. The heat from the operational plant caused truck mirrors and windshields, coming in from the outside, to fog up. Space was very tight. Two IMI mixer trucks were always on the site along with a laser screed, forklift and a spreader to apply the hardener. Safety was a major concern. With over 60 mixer truckloads rolling into the work space, limitations to visibility had to be dealt with. IMI had two people on the ground at the site at all times. They sprayed the mirrors with water prior to driving into the heated site to eliminate the fogging. This allowed the trucks to move into position immediately and kept the finisher supplied with concrete throughout the entire pour. They also guided the trucks in and out of the site. IMI delivered 600 yards of concrete to the site over a two-day pour without any safety incidents. Tests on the concrete showed that slumps were consistent from one truck to another. Strength tests also showed that the specified 4,000 psi was met by each load of concrete. For more information on safety on the job site, click here. For more information on concrete slabs, click here.